Picture from wicklore : Preparing for Adventure! I first made enquiries with a boat operator in Kerry in February 09 about going to An Tiaracht. They explained that the island is the private property of the Commissioner of Irish Lights and that visitors are not allowed. It was also explained to me that landings are just not possible due to the nature of the rocks and cliffs of the island. In mid 2009 I contacted the Commissioners of Irish Lights directly and spoke to Robert Sparkes there. After explaining my interest he kindly offered to make an exception and allow me to go out to An Tiaracht as a guest of the Commissioners. That would involve flying out and spending the night in the lighthouse, accompanying the Attendant on his scheduled maintenance visit. You will need to bring your own food, and bedding, including reserves of food in case your visit is longer than planned. This is a dangerous rock that can easily be wave swept. Early on the 8th December I waited at the Irish Lights building in Castletownbear in Cork. 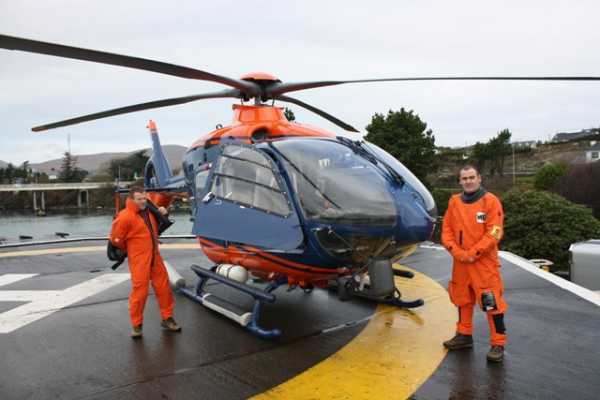 There was a buzz of activity as Attendants prepared for various helicopter trips to some well known lighthouses Fastnet Rock and Skellig Michael are two that I knew. After a full safety briefing we suited up in our bright orange flight suits designed to protect us in the event of the helicopter ditching into water. The trip to An Tiaracht would be the first of the day and we assisted in the loading of the cargo. The pilot, Colm Martin, was wonderfully friendly and put me at ease about the trip.